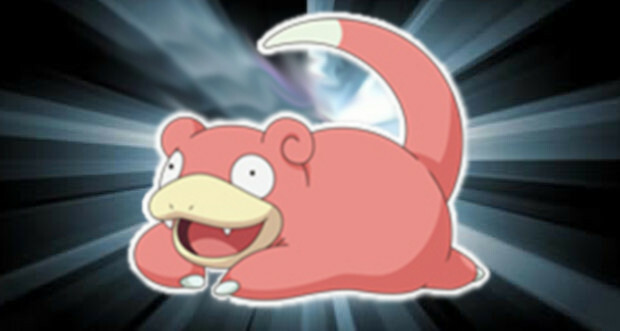 Slowpoke (ヤドン, Yadon), is known as a Dopey Pok�mon. The name Slowpoke is an insult for someone who acts or moves slowly. Slowpoke's Japanese name, Yadon, has the word don in it which means slow or stupid. This mammalish Pok�mon has a tail which gets lighter towards the tip, a tan muzzle, and curled ears. They use their tails to fish by dipping them in the water at the side of a river. Slowpokes do not feel pain if their tails are bitten and take 5 seconds to feel pain when under attack. They are often vacantly lost in thought and can spend entire days loafing at the water's edge. Slowpoke's tails leak a sweet sap from the tip which make the tails pleasant to chew on, though the sap is not nutritious. If a Shellder bites its tail, it will evolve into Slowbro, and if one bites its head whilst holding a King's Rock, it will evolve into Slowking. Residents of Azalea Town in Johto place Slowpoke in high regard and the community revere them. The town is home to the Slowpoke Well, a small underground cave where lots of Slowpokes live. It is said that the yawn of a Slowpoke from the well ended a drought plaguing Azalea 400 years ago. Team Rocket tried cutting off their tails to sell in Mahogany Town. In the anime, Slowpoke has never been seen to use an attack. In Pok�mon Mystery Dungeon: Explorers of Time and Explorers of Darkness, Slowpoke is a member of Team Slacker, the zero motivation exploration team.